Fat and Happy Food Blog Tips and Techniques: If you use dried beans, plan ahead as you'll need to soak them the night before you use them. Mix together the mustard, jelly and garlic, toss the rabbit pieces in the marinade. Season well with the seasoning salt and pepper. In a 3.5 quart oven dish, brown the rabbit in a drizzle of oil (add all the marinade on the rabbit) and then set the rabbit pieces aside. Add the onions to the same rabbit pan, cook over medium heat for just a few minutes. Add in the sausage, crumble the sausage into medium sized pieces. Add in the carrots, garlic and dried thyme, let cook for about 5 minutes. Pour in the wine, use a wooden spoon to get all the tasty pieces off the bottom and sides of the pan. 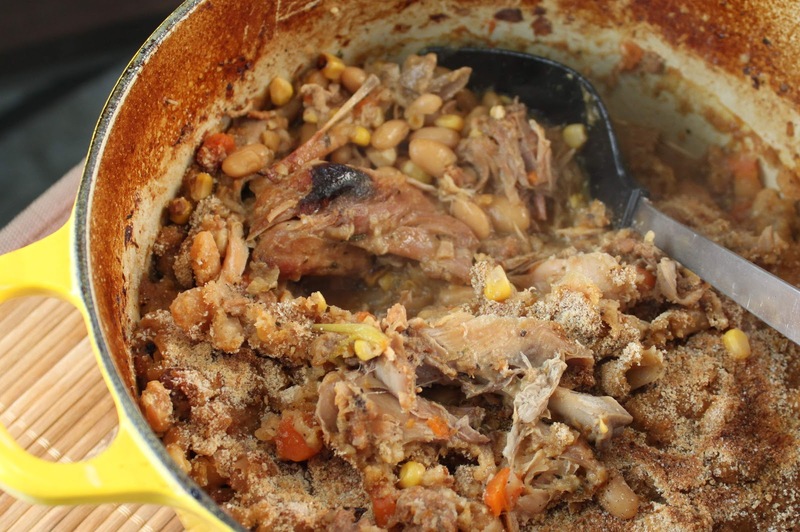 Add in the broth, corn and cooked beans then nestle the browned rabbit into the casserole dish. Cover the dish and bake at 375 degrees for about 2 hours. Check the dish half way through, you may need to add a little more broth to it. 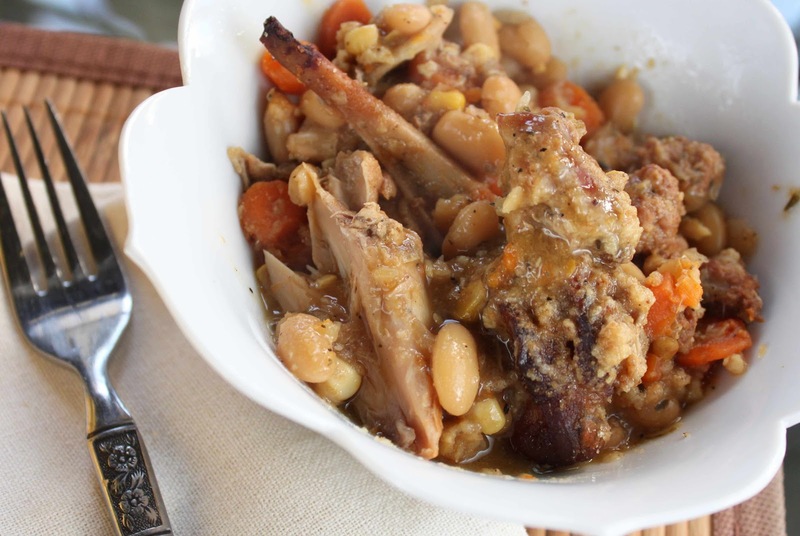 Turn the oven to broil, remove the lid from the pan, sprinkle the cassoulet with the bread crumbs. Add a pinch of salt and pepper on top of the crumbs and brown under the broiler. They key with dried beans is the soaking process to remove the noxious gas. It certainly takes more time and planning to use dried beans but the difference can be be converter-worthy. 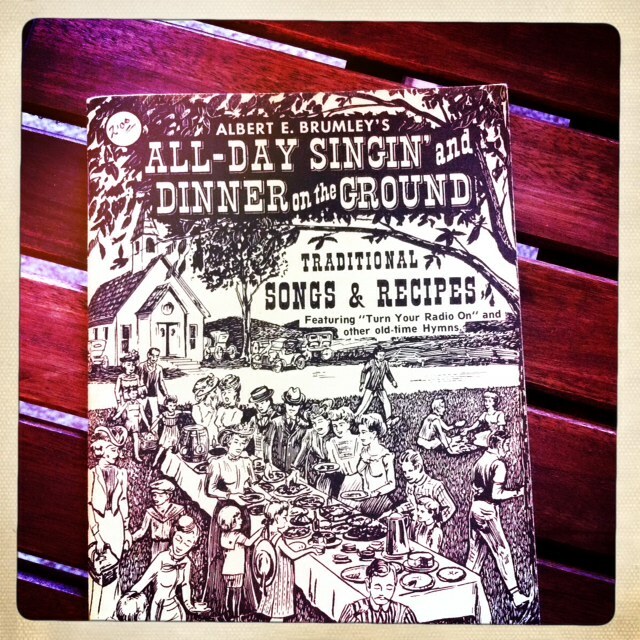 Personally, I lean on canned beans quite often; but some recipes just scream for the attention of simmered beans. This rabbit dish was one such dish. There are many great directions for cooking dried beans. Follow this link for basic directions from the California Dried Bean Advisory Board, and there are great directions for cooking dried beans here. I add onions, garlic, thyme and bay leaves to both the soaking and cooking water for flavor. Please take a moment to look at all the rabbit recipe swaps created by this crew. We are a immensely talented and diverse, as you'll see in the various interpretations of this humble recipe by: Christianna, Dennis, Toni, Shumaila, Alex, Lora, Lindsay, Mari, Pola, Jamie, Claire, Shari, Joy, Monique, Linda, Priya, Rachel, Alli, Katy, Emily, Krissy, Jacqueline, Lana and Jaclyn. Visit the swap page for everyone's bios and please visit all of our blogs to let us all know what you think of our inventions! ooh! What they said! I love cassoulet, and I love that you interpreted the dish with rabbit - thanks again for participating in the swap, I love reading your inspirations and inventions. Okay, my mouth is drooling now! This is gorgeous. I had rabbit once but I have a sneaking suspicion I would prefer your cassoulet. Oh, I am a sucker for a good cassoulet! What a fantastic idea & delicious take on the swap. 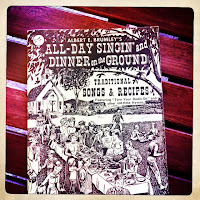 Great photos, great recipe, great post! 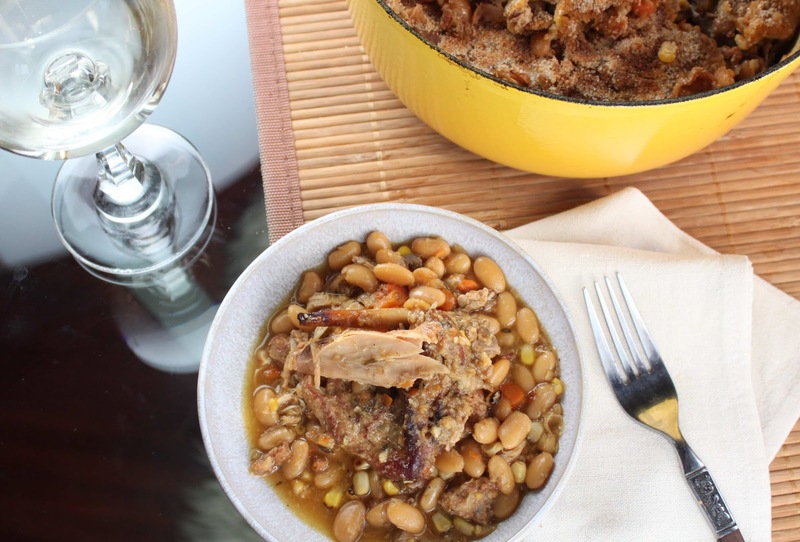 I prepared cassoulet only once, and while it was pretty time-consuming, it was worth the effort. I am so jealous you managed to find the rabbit, but one of these days (soon!) it will end up in my pot, too! This is a great dish for Autumn, which is approaching fast! We've had a hot week here in Serbia, but tomorrow the Fall begins, as we expect rain and a cold front. I love being a member of this group - so many talented people with great ideas to inspire! That is really funny you wore camouflage for the occasion..great idea! I wore a white tank top to feel like a butcher when preparing the rabbit! Your marinade of mustard, apricot jam and garlic sounds so interesting and tangy! Hi there, this looks so good. This looks so warm and inviting! Great take on the Swap! Would have loved to try it out- thanks to my husband, rabbit is something I'll never get to make! This recipe's looks good and delicious. But I don't I can do this to my lovely bunny. I can use chicken instead. Pet Food: Save your bunny! Chicken will work great in this; I would suggest using dark meat and including the bones to get it extra flavor.